As we have pointed out over the last few months, analysts frequently get it wrong. Nothing illustrates this more than Google's earnings beat yesterday afternoon. Most analysts on the stock have issued negative outlooks, citing the economy and slowing paid clicks as reasons for reducing estimates and price targets. We commented in a note on 2/29/08 that perhaps data regarding Google's paid clicks was being mis-interpreted, and if in fact that was the case the selling was overdone (click here for old post). Mr. Birinyi also appeared on Bloomberg TV recently to discuss his views on the market, and mentioned GOOG as one of the two stocks he was currently buying (click here for Bloomberg story). 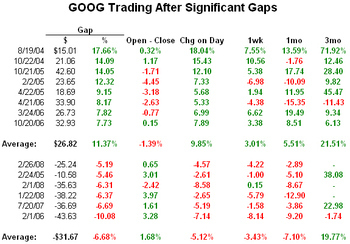 See below for how Google has historically traded during the day and in the months to follow significant gapped openings. To stay ahead of the market and keep up with Birinyi Associates' most current views and analysis, click here.